Raw banana is a good source of Iron and hence its consumption is a boon for women. However the consumption of raw banana in curry is very limited. Here is a recipe which is easy to make. This is one of the popular kofta curry made with plantain fried dumplings or kofta served with flavored sauce. 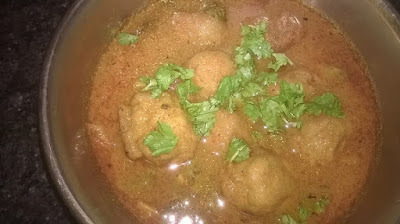 Raw banana kofta curry can be made in few ways one is the here that I am posting a proper north Indian style another version is rich gravy where used cashew-nuts paste and fresh cream etc. I have already postCabbage Kofta Curry same way too. If you want to avoid for deep frying then you can grilled these koftas in microwave or shallow fry. Bread Fritters is an extremely interesting snack recipe that you can prepare for your loved ones on any holidays and evening snacks. It’s kids favorite snacks and it is very easy to make. Take a bowl add besan, rice flour or semolina, salt, red chilli powder. Turmeric powder, ginger-garlic paste and add some water, mix properly and make a thick batter. Cut the all bread round shape, square shape or triangle shape. I prefer always square shape. Turn on the flame and heat a deep- bottomed pan. Add any type of oil and let it heat. Drop a pinch of batter to check the temperature of oil. 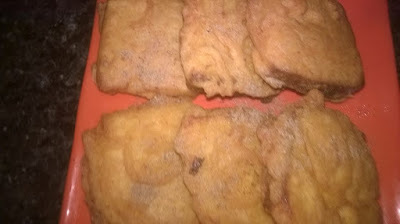 Dip the bread slices in the batter and put it into the oil. Fry it for a minute then gently flip it to fry the other side.